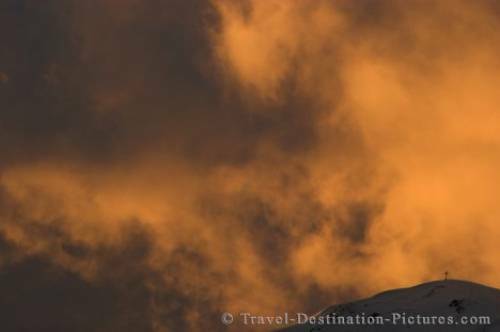 During a spectacular sunset in the austrian alps the clouds began glowing bright orange when illuminated by the setting sun. A tiny cross atop one of the massive peaks of the Austrian alps, stands out against the clouds which are highlighted by the reflection of sunset. The Pinzgau region is a popular winter time destination near Salzburg in Austria for skiing and winter recreation. The sunsets are fabulous in this region and on any fine evening as the day draws to a close the sunset light reflects on the snowcapped mountains of the alps or in the clouds above. Picture of the reflection of a beautiful vivid sunset in the clouds above the Austrian Alps, Pinzgau, Austria.